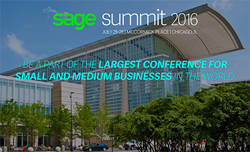 Sage Summit 2016 - Ignite your passion! ZAP, the leading provider of data intelligence solutions and Sage, the market leader for integrated accounting, payroll and payment systems for small & medium businesses have entered into an OEM partnership to embed ZAP data management and modeling platform with Sage X3 – Sage’s flagship business management solution for the midsize enterprise market. This OEM partnership will provide Sage X3 customers, partners and software developers with built-in data models for reporting on data from multiple sources –including Sage X3 core applications, complementary ISV solutions, and virtually any data source connected– as well as to quickly incorporate customizations in Sage X3. The solution will also reduce the pain of typical ERP migration, by keeping insight into historical data from previous ERP systems after switching to Sage X3, without the need to migrate all old/historical data into the live system. Optionally, users will be able to take advantage of ZAP’s visualization tool for all of their data representation and analytics needs. This solution will be showcased at the Sage X3 booth during the Sage Summit, July 25-28, 2016 in Chicago, IL. Global availability will follow as part of the Sage X3 release cycle in FY17. Garth D. Laird, President of ZAP comments: “Together Sage and ZAP intend to offer high-value solutions for process and business oriented professionals using Sage X3. The OEM solution is designed to enable companies using Sage X3 to strengthen their decision processes, increase their customer value and create sustainable competitive advantage in this rapidly evolving global economy”. “There has been an explosion of self-service solutions for the analysis and representation of data” says David Krauss, Global VP of product marketing at Sage . “Our partnership with ZAP recognizes that, and will offer Sage X3 customers a common data management platform for their analytical needs, that inter-operates with virtually any data representation applications while ensuring the integrity of the data models and simplifying the integration of new data sources dramatically. Additionally, this new solution is a step forward accelerating data migrations from other systems, and demonstrates our commitment to support customers with more robust enterprise business management capabilities as they grow.”. ZAP delivers world-class data automation, data modeling, and data visualization solutions that support governed and trusted data outputs from a central point in the business, allowing organizations to better manage their business through enhanced insight whether On-Premise, Cloud or even Hybrid. ZAP Data Intelligence is a discrete solution that manages the integration of multiple data sources while maintaining repeatable trusted data models that can be leveraged across any business, including specific technology and assets for software vendors looking to provide a fully integrated BI experience for their customers. With the ability to interoperate with other leading self-service visualization solutions, ZAP provides a flexible, scalable and economic solution for the data needs of any business. Sage is the market leader for integrated accounting, payroll, and payment systems, supporting the ambition of the world’s entrepreneurs. Sage began as a small business in the U.K. 30 years ago, and over 13,000 colleagues now support millions of entrepreneurs, across 23 countries, as they power the global economy. We reinvent and simplify business accounting through brilliant technology, working with a thriving community of entrepreneurs, business owners, tradespeople, accountants, partners, and developers. And as a FTSE 100 business, we are active in supporting our local communities and invest in making a real difference through the philanthropy of the Sage Foundation.